AKIPRESS.COM - The collapse of the latest Syria ceasefire has heightened the possibility that Gulf states might arm Syrian rebels with shoulder-fired missiles to defend themselves against Syrian and Russian warplanes, U.S. officials told Reuterson Monday. 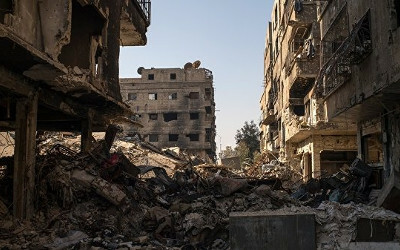 Still, the U.S. administration continues to maintain that negotiations are the only way to end the carnage after Russian-backed Syrian forces intensified their bombing of Aleppo, the last major urban area in rebel hands. The latest U.S. attempt to end Syria's 5-1/2 year civil war was shattered on Sept. 19 when a humanitarian aid convoy was bombed in an attack Washington blamed on Russian aircraft. Moscow denied involvement. On Monday, medical supplies were running out in rebel-held eastern Aleppo, with victims pouring into barely functioning hospitals as Russia and its Syrian ally President Bashar al-Assad ignored Western pleas to stop the bombing. One consequence of the latest diplomatic failure may be that Gulf Arab states or Turkey could step up arms supplies to rebel factions, including shoulder-fired anti-aircraft missiles, something the United States has largely prevented until now. One U.S. official, speaking on the condition of anonymity to discuss American policy, said Washington has kept large numbers of such man-portable air defense systems, or MANPADS, out of Syria by uniting Western and Arab allies behind channeling training and infantry weapons to moderate opposition groups while it pursued talks with Moscow. But frustration with Washington has intensified, raising the possibility that Gulf allies or Turkey will no longer continue to follow the U.S. lead or will turn a blind eye to wealthy individuals looking to supply MANPADS to opposition groups. "The Saudis have always thought that the way to get the Russians to back off is what worked in Afghanistan 30 years ago – negating their air power by giving MANPADS to the mujahideen," said a second U.S. official. "So far, we’ve been able to convince them that the risks of that are much higher today because we’re not dealing with a Soviet Union in retreat, but a Russian leader who’s bent on rebuilding Russian power and less likely to flinch," this official said, referring to Russian President Vladimir Putin. Asked if the United States was willing to do anything beyond negotiations to try to stop the violence, State Department spokesman Mark Toner did not outline other steps, but stressed that Washington does not want to see anyone pouring more weapons into the conflict. "What you would have as a result is just an escalation in what is already horrific fighting," Toner said. "Things could go from bad to much worse."